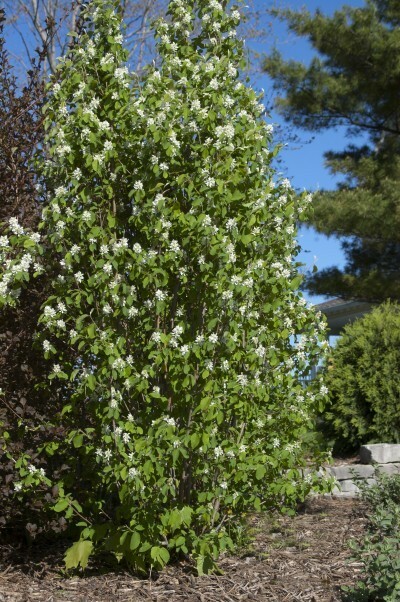 Standing Ovation Serviceberry is the March 2018 Plant of the Month – Glacier View Landscape and Design, Inc.
Amelanchier alnifolia “Obelisk” or Standing Ovation Serviceberry is another one of the more columnar specimens available for small yard landscapes along the Front Range of Colorado. Reaching a height of about 12-15’ and 4-5’ wide, its upright form earns it the name. Saskatoon Serviceberry, from which Obelisk is derived, have long been used in the landscape, but their generally larger size has precluded them from the small yards of traditional suburban neighborhoods. Now, that has all changed with the introduction of the cultivar ‘Obelisk’ which like all serviceberries has a deep purple edible fruit in late June/July, an abundance of white flowers in spring, and gorgeous fire orange and red fall color. Truly a shrub with 3 seasons of interest. They are very hardy to -50 degrees (zones 2-8), can withstand varying soil types, and can be drought tolerant once established. They do not like to have their roots in standing water or high water tables, and will not tolerate heavy clay soils, but will thrive if given soil amendments when planted, even in our usually clay soils in Erie, Colorado landscapes, for example. Since they are columnar in stature, they can be used to frame a building or a gateway without interfering too much in the overall landscape. Or, they can be used as a single focal point, around which one could plant other ornamentals and perennials. They can even be used as screening or as a hedge if so desired due to their upright stance. They are quite tolerant of most conditions and can be expected to live 30 or more years. This really is a “go to” plant for lots of seasonal color and interest. Plant one or seven in your landscape this spring and enjoy them for years to come!